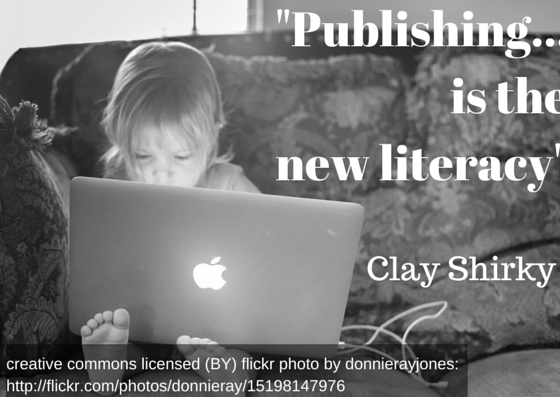 Creating Connections for Learning with Social Media: Bringing Blogging Back! Building on from what was suggested in earlier posts, educators who become familiar with social media tools and who use them in their own personal practice are more likely to feel confident introducing them into the classroom. Blogging is a tool that often isn’t considered when thinking about Social Media, however it is a platform for authentic communication, which allows users to express ideas and connect with others, and therefore is a teaching tool that should not be overlooked. The title of this blog is ‘bringing blogging back’ because as an older social media tool, it may seem that blogs are passe or not likely to draw student engagement. However, setting a student up with a blog where they share their learning is a great starting point for building a positive online presence – and even if you choose to go with a tool that is not entirely public, allowing students the chance to develop skills and familiarity with this genre will mean that should they choose to keep a blog of their own in the future, it is more likely to be a well-presented document of themselves online – always a positive in a world where social media is often the first place potential employers browse when deciding among applicants! Blogging is also a great strategy for teachers to not only develop their own online presence, but for reflecting, sharing, clarifying their thinking and more. Steve Wheeler writes very convincingly and comprehensively when presenting Seven Reasons Teachers Should Blog, another fan of teacher blogging is George Couros – read his reasoning here. To begin blogging with students, start off low tech. social media doesn’t have to completely rely on computers and the internet! Try wall blogging, suggested by Silvia Rosenthal Tolisano, where students share their blog post and others post their comments using post it notes before moving onto publishing online. When making the move online, it is good to consider a number of different platforms, as each have their strengths and weaknesses. Two platforms to consider, that represent different approaches, are WordPress and Kidblog. WordPress is an open blogging platform used by the general public. There are two WordPress formats; .com which is hosted by WordPress, and is the best one for beginners, and .org, which is self hosted, and requires just a little more tech expertise (as well as somewhere to host it). I would advise going with .com for students. WordPress is open, flexible, and lots of options – and it may be a good platform to consider if you have switched on high school students who want lots of flexibility in how they publish and share their work. However for younger students or when privacy is a consideration, Kidblog is worth exploring, as it allows the teacher to set up student accounts which they can access without needing to create an account or have an email address themselves. If neither of these take your fancy, don’t despair! 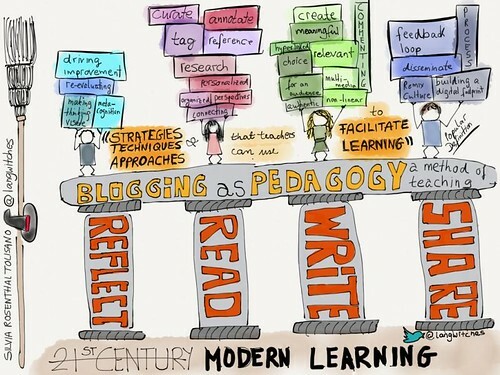 There are lots of blog platforms out there- a good guide is the The State of Educational Blogging 2014 which summarises a range of platforms from an educational perspective. There are many reasons why you might consider having your students blog. Some schools are using a student blog as a portfolio to capture their work, or as a place where students can reflect on their learning. The act of writing regularly is a valuable literacy skill, and the ability for other students to comment enables peer support and an authentic audience. Depending upon the platform you choose, blogs can be as open or as locked down as you wish, and many learning management systems have a blogging tool built in. Blogging also informally teaches students about digital safety, and the language of digital publishing as they’ ‘tag’ their posts with keywords to assist in locating them later, comment and respond to comments, manage their account, choose copyright free or creative commons images to include and assess their blog ‘stats’ to measure how many hits they have received, from what locations and more. 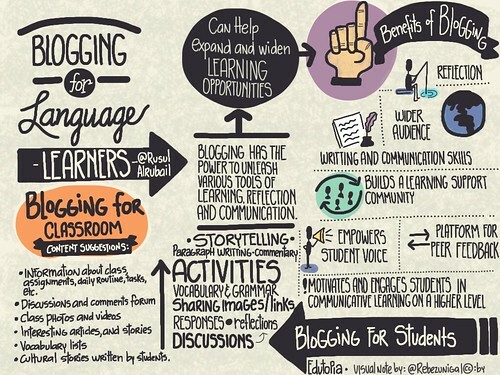 A great blog post on blogging as pedagogy has been shared by Silvia Rosenthal Tolisano, who has put together a number of resources on blogging in the classroom including this fabulous printable handout, Getting to Know Your Blog. Students don’t always need to have their own blog – a class blog which is jointly constructed could be a fantastic shared writing experience for younger students, and older students could be extended by writing blog posts from the perspective of different characters in a book – a single blog could have posts written by a different character each day. Click on this image for a live demo of this image focused blog theme. Blogs don’t necessarily have to be text based either; while Tumblr and Instagram are popular image blogging social media apps, more control could be maintained by establishing a single traditional blog account, and having students upload images they have created (photographs, scans of artwork etc). Platforms such as WordPress have a range of templates, some of which are designed particularly for image based blogs. This would be terrific for art students, photography classes or any student who had a preference for visual expression. When it comes to commenting, there is an art to this also. While blogs don’t encourage the same level of interactivity as Twitter or Facebook, there is definitely the capacity for conversation to develop in the comments section. Leaving constructive, clearly expressed comments is a skill that many overlook, and yet this type of feedback can be a powerful form of instruction, particularly when it comes from peers. In addition, there is always the potential for teachers to negotiate with colleagues, or even better a ‘guest commenter’ such as an author or expert in the field of study to add their thoughts – a very authentic learning opportunity! And so, I encourage you to think about beginning a blog; or getting your students to blog; or creating a class blog – and if and when you do, share your experience in the comments and bring THIS blog alive too! This entry was posted in Communication, Information Literacy, Learning, social media, Technology and tagged blogging, communication, information literacy, pedagogy on August 10, 2015 by Kay Oddone.